Dive Journal: Myron, Mercedes, and I decide to do a brief late afternoon dive off Baby Dock - Mercedes refers to it as a "Sunday dive" - while Linda decides to take a quickie nap. This time, Mercedes remembers to bring along a few of the hotdogs to feed the fish - she manages to stuff six of them up the sleeves of her Polartec wetsuit. We descend over the reef to about 50' in depth, where we stop and begin trying to convince various fishes to nibble at the hotdogs directly from our hands. Mercedes gets interested in a friendly but timid grouper and assumes a comfortable prone position over the reef, gently coaxing it closer. Myron and I hover eight feet out from the reef in mid-water, watching her progress. From the reef at a point around 10 feet south of us, a 3-4' long spotted moray eel suddenly lurches from his hiding place among the corals and starts a wriggling swim towards us. It is unusual to see the eel free swimming during the day. The eel vectors towards Myron, who is now holding one of the hotdogs. Hoping to see the eel feed, and hoping to divert its attention, Myron breaks off pieces of the hotdog and slowly tosses them towards the approaching eel. The eel, however, who has poor vision but excellent smell, makes no reaction to the pieces and instead keep steady progress towards Myron! We also spy a small wreck further south, but do not take the time to explore it. It looks like a capsized panga at best, not terribly interesting. On the way back to Baby Dock, we play with a beautiful sharptail eel wiggling along the sand flats - very neat. He looks like a cross between a worm and an eel and is painted in pale tan and white spots. Clearing my ears has become painful for me these last few dives. Although some advice suggests that a slight "overclearing" (overpressure) is desirable, I think that I am going too far with this theory, and I am blowing too hard for too long. Along with the ear pain is a noticeable hearing loss out of the water. Myron and Mercedes assure me that this is normal and will likely pass, and I promise myself to clear more gently. I also begin to use the Swimmer's Ear drops, a mixture of acetic acid and isopropyl alcohol that helps dry out entrapped water and prevent ear infections. We have reservations at the nearby Green Parrot Restaurant tonight for a Fourth of July celebration, a holiday that is otherwise not celebrated on Bonaire, of course. The Green Parrot is associated with the Sand Dollar Resort, where we will move in a couple of days. Linda's thoughtful reservations have landed us a GREAT seaside table, the best in the sold-out restaurant. Mercedes and Linda opt for the special drink of the night, a concoction of rum, Tia Maria, and coconut stuff that is very tasty indeed. There is a huge very-American style buffet full of fried chicken, smothered steak, potato salad, cole slaw, fish with garlic sauce, barbecued beef, barbecued pork, and mountains of corn-on-the-cob. It doesn't take us long to get stuffed. During our meal, we run into Internet friends Scott and Sandy Barlass at a nearby table. 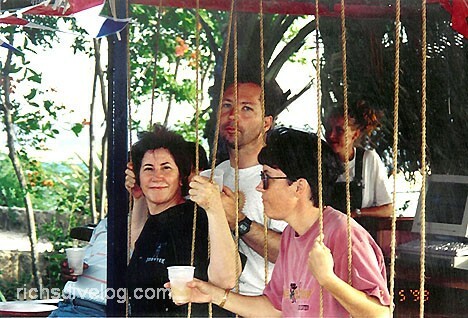 Scott has been kind to share many Bonaire experiences and advice through email with Linda. The Barlasses are purchasing a dream home on Bonaire and plan to set up a small business within a year or so. Scott tells of actually going to meet the legendary Captain Don (now a Bonairean landscaper) and ringing the doorbell at his home on Bonaire. Evidentally, Captain Don answered wearing nothing but a hat, explaining that his home was now a clothing-optional zone. He certainly sounds like a colorful character. At 8:30PM, a big fireworks show commences! Pyrotechnics are launched from a rock jetty out over the water, and we have front row seats! It is an impressive display, with lots of booming missile events. One stand of about 5,000 firecrackers is ignited - it seems to bang away forever. All of the fuses are lit by hand - yikes! One big missile explodes unlaunched on the jetty - ka-boom! A marathon tube of Roman candles and noise-makers provides a finale amid cheers from the restaurant. Green Parrot does a nice job with Fourth of July. We walk back to Captain Don's, where we are entertained by yet another fireworks show from the jetty in front of RumRunners. A majestic Sousa march is emanating from the loud speakers. The music is stopped mid-strain and switched to Jimi Hendrix's Star Spangled Banner for several minutes, then briefly to a Dutch anthem, then back to Sousa, all as the fireworks fly. Strange and funny. Myron notices that a few divers are out making a night dive and observes that it must be cool to watch the fireworks sub-surface. A local band finally gets cranked up. They are billed as "Moogie and the Studmuffins," but we learn that they have changed their name to the more sedate "Alliance." The lead singer is, of course, Moogie, along with a keyboardist (Habitat general manager), guitarist (Habitat employee), and drummer (our friend and divemaster Jost). The band is a lot of fun, with Jost clearly the most talented musician of the bunch. Jost's rhythms and fills keep the otherwise unorganized performance together and interesting. Anyway, we learn that the band is only a few weeks old. Shortly, the bartender comes out and does a spirited dance on the floor to an Alliance rhythm. Notable since she is cute, well endowed, and wearing a lime-green tube top. Myron soon begins to comment how lime-green is one of his favorite colors. We also gather that Lime-Green is Jost's main squeeze. Myron and Mercedes retire, while we stay at the party for a while. When we return to the cabin, we report to Myron that Lime-Green has lifted her tube top for the crowd while dancing, a nice bouncy spectacle. Myron bites on this hard and quickly redons his shirt, socks and shoes to begin a trip back to the party. Before he can leave, however, we reveal the possibility that we MAY have exaggerated a bit. *Addendum 12/1/2007: More then nine years later, Myron recalls the fateful battle with the eel from his side of the mask below. "Earlier in the day, we'd discussed fish-feeding in Bonaire with some other divers. They told us that just one day earlier, a woman had been bitten hard in her lip by an eel. A very painful injury, apparently. She had the smell of food (likely hot dogs) on the mouthpiece of her regulator, and the eel (being near-blind, but with an excellent sense of smell) had taken a bite. Having just heard this story, plus having seen Mercedes' hand being bitten by Yellowtails during her last fishfeeding, I declined to join Mercedes this time. But she'd asked me to hold a whole hot dog for her, since she was carrying all she could. While drifting weightless at about fifty feet depth, out of the corner of my eye I saw a four-foot moray eel leave his home and come swimming directly at me. Not wanting to have "an eel experience", I broke up the hot dog and tossed the pieces as far away from me, and as close to the eel, as I could. The eel ignored the hot dog pieces and kept coming at me. The eel approached me at waist level and then its head slowly worked its way up my body. I almost felt like the eel was wrapping itself around me. I froze, with one hand on the handle of my dive knife, visualizing a repeat of the scene where Tarzan rolls with a crocodile in a death match. I figured that any sudden movement would be an invitation for a bite. The eel's head came up to mine, he looked me in the face, and then started to work his way back down my body. Whew! He didn't bite me! Just before leaving, the eel had second thoughts. He lunged at my upper thigh with his fangs. It didn't hurt much, but I definitely knew I'd been bitten, about three inches from my crotch. Stunned, I reacted, shooing the eel away. Then I examined my wound. There were two small holes in my brand-new wetsuit, and two matching punctures in my upper thigh. Too close for comfort."